For a while I avoided cod. I'd eaten it many times and knew it was a super mild fish that (I thought) was best battered and fried. In addition, I work in a fish market where I have the opportunity to take home much more exotic filets at wholesale prices. Then, my dad asked me to defrost the months-old filets of haddock taking up space in the freezer and use it up before buying more Chilean sea bass and halibut. So, I did. I (begrudgingly) breaded and fried his piece as per request. I was less than enthused with my piece of defrosted haddock and (begrudgingly) threw it in a pan with some old bay and black beans and called it a meal. To my surprise, it was really good. I guess I had forgotten how satisfying a flakey and mild white fish can be. I began to think that, though they may be common, haddock and cod have something special about them. The next day, like a 14 year old girl refusing to repeat an outfit, I couldn't bring myself to buy haddock and make it twice in a row. So I got cod, which is so similar to haddock that when we run out of it at the fish market we make a display of skin-on haddock and a display of skin-off haddock and call the skinless filets cod. A 14 year old girl might've looked down her nose at me, but in my heart I knew I wasn't a repeater. Working at a fish market definitely has its perks. Most customers settle for a whole filet of cod, which always has a thin side and a very thick side making it impossible to cook evenly. I, however, have the luxury of cutting off the loin of the largest filet for my dinner. This particular cod loin was about as tall as it was wide and provided two super thick chunks of flakey fish. My dad wanted his piece made like they make it at Eat n' Park, a diner style chain restaurant in Pennsylvania, Ohio, and West Virginia. Eat n' Park is known for their cardboard-like, but free-for-kids "smiley cookies," not their cod. So I upgraded slightly and baked his with panko crumbs, parsley, orange juice, olive oil, salt and pepper. Mine, however, I consider somewhat of a masterpiece. The roasted red pepper tapenade is tart, acidic and smokey. However, unlike traditional tapenade, its not overwhelmingly strong in flavor because of the mellower flavor that the bell pepper adds. Its also beautiful perched atop that cod loin. Place whole red pepper directly over the flame of a gas burner. Allow to sit on the grate for a few minutes on each side, turning when the skin of the pepper begins to develop a char. When pepper is tender and evenly charred, remove from heat. Cut off one third of the pepper and roughly dice. Place in food processor with olives, 2 cloves of garlic, lemon juice, salt, pepper and basil. Process until evenly minced but not pureed. 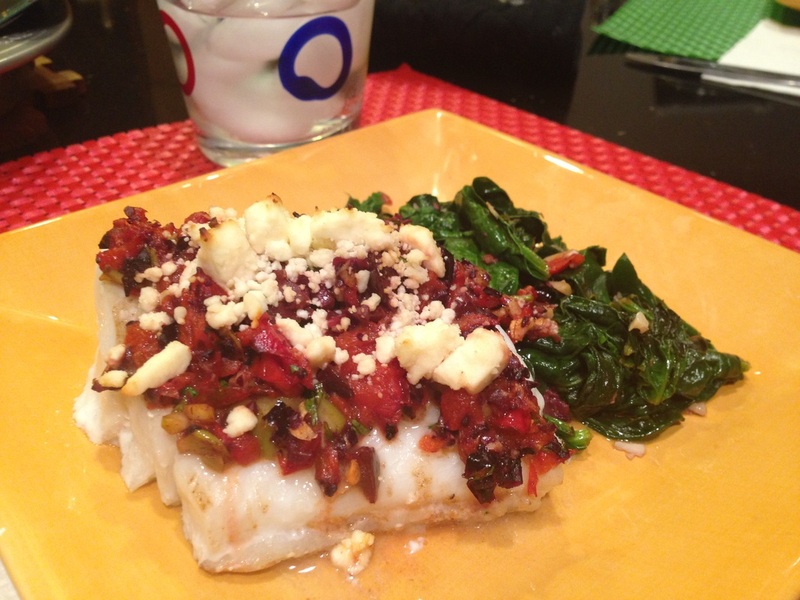 Place cod in a lightly greased baking dish. Top with tapenade. Sprinkle with feta cheese. Bake in a 400 degree oven for 14 minutes or until cod is opaque and flakey and around 140 degrees in the center. While the cod is in the oven wilt spinach with 1 cove of garlic and a spritz of olive oil in a covered sauté pan over low heat.